When Ten Runs Almost Isn't Enough ~ The Bucky Channel - The World of Sports from Wisconsin's Perspective. When Craig Counsell hits his first grand slam in twelve years, you know it's going to be a pretty good afternoon. Unless, of course, you have a pitching staff like the Milwaukee Brewers. I'll admit, when the Brewers went up 10-0 in the first inning against the Washington Nationals on Sunday afternoon, I penciled this one in as over. I was happy that the Brewers were going to avoid the sweep, happy to see our offense back on track, and happy that Doug Davis was almost assured an automatic win for my fantasy team. I should have known better. Thankfully, the Brewers still got out of this one with the 11-7 victory, but Doug Davis let things get way too close for comfort. He was cruising along for a while, as it's a whole lot easier to pitch when you have a ten spot in your back pocket, but once he got into the 5th inning he started to collapse. Davis gave up four runs in the bottom of the 5th and had to be yanked with the bases loaded to avoid any more damage. Because he didn't go five innings, that means he wasn't eligible for the win. So that hurt the old fantasy team. More importantly, it hurt Davis's ERA, which is now a whopping 11.25 on the young season. So much for that big free agent signing. Claudio Vargas came in, gave up a few more runs, and the Nationals were back into this thing. 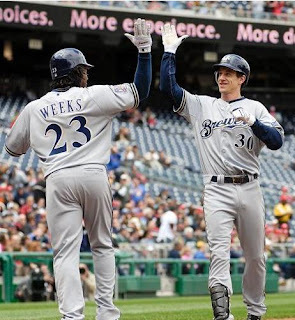 But Manny Parra and especially Carlos Villanueva did a nice job of shutting down the comeback, and the Brewers earned a much needed victory to end a dreadful road trip. As far as the offense goes, it's always nice to see your team put up runs at ease, but ten runs in one inning is quite impressive. A lot of the credit goes to Jason Marquis and his inability to find the strike zone, but we gotta give Craiggers props for the grand slam, as he is without question our vote for Player of the Game. Other offensive highlights included three hits from Casey McGehee, and Jim Edmonds first RBIs of the year. Milwaukee does improve to 5-7 on the year, and it's clear they are still trying to figure out what kind of team they are going to be. The pitching has been very weak so far, and we're still waiting for Prince Fielder to break out. But there are a lot of positives to be happy about, such as how the Brewers have been scoring runs via their speed and the bullpen performances from guys like Parra and Villanueva. Clearly, there is still a lot of work to do. The Brewers will get an off day on Monday to rest up and then it's a three game series against the Pittsburgh Pirates that starts Tuesday. That game will be on WMLW and not available outside of the Milwaukee area because FSN Wisconsin will be carrying the Bucks playoff game. Dave Bush will get the start against Pirates youngster Charlie Morton, who has been struggling to say the least. Hopefully the Brewers can take advantage and get back to .500 on this homestand. What up with that, what up with that?